The Alan Stern proposal for defining planethood has no strong basis in the physical or dynamical characteristics of the objects. As such, we do not find it to be a satisfactory classification system. What planetary scientists do find sensible is a classification system that incorporates the fact that there is a multiple-order-of-magnitude separation between two regimes of objects, so we can separate planets from dwarf planets by something that is very much grounded in physics. The "clearing the nabourhood" criterium does sound a bit silly. Is a potential planet a proto-planet until it has finally "cleared" the last piece of rock (how big?) in its orbit, even if it takes a billion year or more? If Neptune had dominated its orbital zone zone, Pluto wouldn't be there, thus Neptune doesn't dominate it's orbital region. So it's not a planet by this rule radius doesn't matter in this definition if you have a round stone 5mm in size and set into a "clear" orbit around the sun it's a planet, but Pluto isn't,. Does this definition honestly make sense? Makes ZERO sense in my mind. And if you compare that stone next to Pluto, it is invisible, Pluto is ALOT larger, but not a planet by this rule. Thats so illogical. It would be better to set a size limit, 1000KM perhaps? It's alot simpler. "Clearing the neighborhood" is actually a criterion that can be rigorously mathematically characterized, has a sound physical basis, and when we look at the objects in our solar system we find a very strong bimodal distribution (due to that sound physical basis). In a nutshell, a solar system begins with billions and billions of little objects orbiting in a random distribution throughout the protostellar disk. Some of them got a bit bigger than the others as they merged together and accumulated dust. As they get bigger, they become more capable of continuing to get bigger - they have stronger gravity and a larger collision area, which allows them to better accrete or scatter nearby bodies. This is a positive feedback loop, so once it gets going in earnest you'll soon wind up with only a single planet in any given orbital region. Here is an article about clearing the neighborhood, complete with several mathematical measures and tables of the results for major bodies of the solar system. You'll note that all of the various measures show a large gap between the group of objects that are strongly capable of clearing their neighborhoods and the group of objects that are only weakly capable of clearing their neighborhoods - you never see objects which are somewhere in the middle. This is due to that positive feedback loop I described above. The philosopher Plato once said on the subject of classifying natural phenomenon that one should "carve nature at the joints." If you're going to categorize something you should pick criteria that result in clear boundaries, with as few marginal or ambiguous cases as possible. Clearing the neighborhood is one such criterion. An arbitrary diameter would not since there is a smooth distribution of object sizes, especially down at the smaller end of things where Pluto lies, and there's no physical reason to expect a gap anywhere in the curve. Most of the quibbling I see over "clearing the neighborhood" generally just shows a lack of awareness of the actual scale of the numbers behind it. Though IMO Alan Stern doesn't even have that excuse and is just a hypocrite - the mathematical formula that was most likely the inspiration for the IAU's planet-clearing criterion is the Stern-Levison parameter (it was presented at the IAU's previous meeting) and Stern was the co-inventor of it. He didn't reverse his position and become the biggest booster of Pluto's planethood until he became the principle investigator for the New Horizons mission, and he hasn't actually published anything that refutes his earlier work - just contrary opinion pieces and interviews in popular media. Anyway. 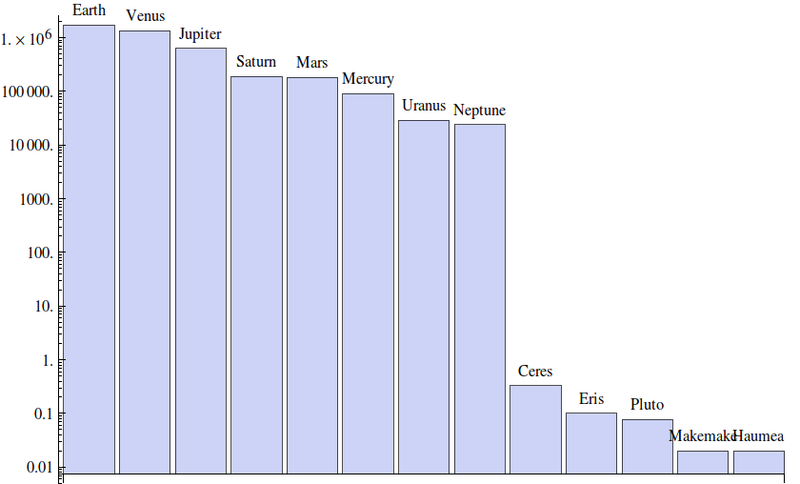 To address the specific objections that are most commonly raised by Stern and others: Neptune's planethood is not compromised by Pluto's presence because a) Neptune is way, way bigger than Pluto and b) Pluto is in a 3:2 orbital resonance with Neptune - Pluto will never approach Neptune and has thus been "cleared" by Neptune's gravitational influence. This is not the case for Pluto, on the other hand, since it shares its orbital neighborhood with dozens of large Plutinos that it has not put into a resonance with itself. Stern's own paper on planet-clearing holds to this. Earth would still be a planet if it was moved out to Pluto's orbital radius - run the numbers for yourself and see. You have to move it thousands of AU out before its orbit-clearing capability becomes as small as Pluto's currently is. Earth is not disqualified for planethood because it has a Moon, Jupiter is not disqualified because of the Trojan asteroids. Those objects are gravitationally dominated by the larger body in the same way Pluto is dominated by Neptune. Earth is not disqualified for planethood because of Earth-crossing asteroids. 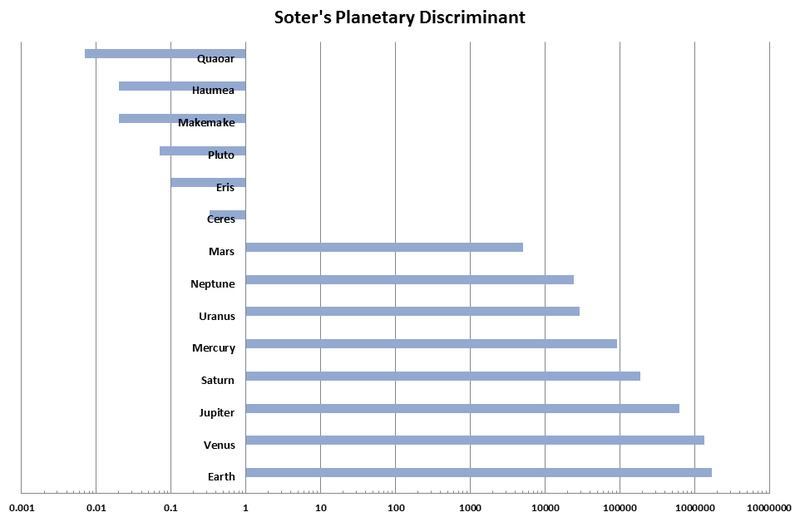 The quantity of matter they represent is insignificant - the Soter planetary discriminant is based on empirical measures like this and it agrees closely with theoretical measures such as the Stern-Levison parameter. I think those are all the usual points. All the math involved just makes it complicated, why would you want a complicated way over a simple method? Because the math ties our classification system to what we observe in nature. It captures the processes by which objects become separated into these fundamentally different classes. This is preferable to a classification system that distinguishes classes by arbitrary choices that have no basis in physics, like "everything smaller than [choose some object] or [choose some nice base-10 number of choose some unit] isn't a planet". Also, just because the math might not be comfortable should not detract from its use. Nature is under no orders to make our task of describing it mathematically convenient for us. Why should I use integrals to calculate the field produced by a distribution of charge? Why should I use differential equations to model predator-prey and population dynamics? Why should I use tensors to describe gravitation? The problem with trying to apply simple solutions to complex problems is that even if you get it "right" in broad strokes, there's going to be a lot of leftover edge cases that fall outside the solution and don't work so well. Take the 1000km diameter cutoff proposal, for example. There are 16 moons in the solar system that are larger than 1000km in diameter, are they planets? If not, is it because of the circumstances of their orbit? Why should their orbital circumstances matter, but Pluto's crowded neighborhood doesn't? Is Jupiter now a quintuple planet because four of the bodies orbiting it are larger than 1000km? Then there's Sedna. Sedna's diameter is currently estimated to be 995±80 km, the error bars overlap the 1000km magic number. So is it a planet? When can we be confident enough in our estimation of its size to tell? There are objects even farther out than Sedna whose diameters will be hard to pin down for many decades to come. The Stern-Levison parameter and its ilk avoid this problem because the "fuzzy zone" is inherently devoid of such marginal cases. It's pretty easy to calculate these parameters - we can do it for many known exoplanets, for example, since all you need to know are the planet's mass and its orbital period to figure out how good it is at clearing stuff from its orbit. So we're a lot less likely to find bodies where it's unclear what the correct classification is. If Neptune had dominated its orbital zone zone, Pluto wouldn't be there, thus Neptune doesn't dominate it's orbital region. Incorrect. Pluto's orbit is what it is precisely BECAUSE of Neptune's gravitational dominance. Neptune's gravity shepherds objects in the Kuiper Belt towards and away from specific orbital resonances (Pluto, for example, is in a 2:3 resonance). Far from being an exception, Pluto is actually a perfect example of Neptune's gravitational dominance. FaceDeer, the articles quotes Jean-Luc Margot: "a planet can never completely clear its orbital zone, because gravitational and radiative forces continually perturb the orbits of asteroids and comets into planet-crossing orbits" and he states that the IAU did not intend the impossible standard of impeccable orbit clearing. So isn't there still a somewhat arbitrary line that has to be drawn? It may not be a problem for the solar system, but the need for a planet definition does not only come from the discovery of bodies beyond Pluto, but also observations of planets around other stars. Or let's imagine a transneptunian object yet to be discovered with an orbital period of about 100,000 years still conflicting with Jupiter's orbit, would it take Jupiter's planethood away? Even if we deem that's impossible for the solar system, other stars could have such pesky objects denying planets their proper planet status for a very long time. What if a star captures a rogue planet and it occasionally passes through the orbits its planets every few million years, do the planets lose their status until it's thrown out again, gets a stable orbit or even collides with something? So isn't there still a somewhat arbitrary line that has to be drawn? Only if you think the gap between Neptune and Ceres in this plot isn't significant; that such a distribution of values looks like the result of a random number generator. Edit: this plot has an error for Mars. A fixed plot is shown here. By the planetary discriminant (mass of object divided by total mass of objects sharing its orbit), the planets are closer to one another, and dwarf planets closer to themselves, than planets and dwarf planets are close to each another. By quite a lot. So they are distinctly different groups, and this separation seems to arise naturally from the accretion process and how sensitive the scattering timescale is to object mass. It may not be a problem for the solar system, but the need for a planet definition does not only come from the discovery of bodies beyond Pluto, but also observations of planets around other stars. In other systems, the same dynamical processes will lead to the formation of a set of objects that dominate over everything else, so we expect the discriminant or scattering parameter will reflect this dominance in general. The threshold for their masses may depend on the mass of the star (scattering is faster for shorter orbital periods, and smaller stars lead to smaller orbits), but the concept of accretional growth being a runaway process that builds a few objects which scatter the others should still hold. And it seems like it does, according to simulations. With over 40,000 orbits since the formation of the solar system, then statistically it would have passed through Jupiter's Hill sphere about a thousand times. Jupiter would have scattered it. No, as I said, it's a convenient definition in the solar system that we know. Ok, but would all the other planets have scattered it if it went through their orbit? It would be interesting to know, by the current definition of planets, the ratio out there of systems with planets that have cleared their orbits and system with planets that haven't. These questions are perhaps best answered through running a great number of simulations, to reveal how efficiently planets "clear their orbit", and also check which assumptions about planet formation need modification in order to render the planet definition less useful. If people have done the exercise and found that everything works out nicely, I'm happy with that. Lets say pluto is mars sized, will it still be a planet? If it isn't does that mean we must demote Mars and Mercury? If it isn't a planet but mars and mercury are still planets isn't that illogical? Or lets say we have 3 Jupiter sized objects orbiting their star in about the same orbit, are they planets? By this definition they aren't. They are JUPITER sized but still not planets, does this not raise a flag? Lets say pluto is mars sized, will it still be a planet? it will be a planet. large enough to be round and probably will have enough mass to clear its orbit from other objects. Well if pluto is mars sized it is still dominated by neptune thus not a planet by this rule, yet mars and mercury would still be planets. Which is why we need a size limit to get rid of this complication. lets say you want to make pluto a planet. in this case you would do sedna, eris and more kaiper belt objects planets.